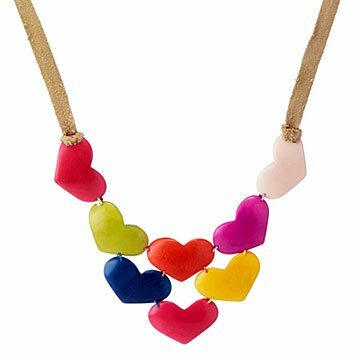 Radiate joy all day long with Paola Delgado's colorful tagua design that celebrates love. No matter what they beat for—romantic, platonic, or puppy love—hearts are happiest when together. This cheerful necklace by Paola Delgado celebrates that joy of togetherness with a cluster of colorful heart beads. She crafts the piece from sustainable tagua nuts, shaving, dying, and stringing them from an adjustable vegan suede tie. Give one to a jewelry-loving friend or family member to help them radiate happiness all day long. Handmade in Ecuador. Cute but smaller than anticipated! The colors are bright, however the hearts are much smaller than the picture. Why do artists depict their products as something they arent?